Friday March 24, 2017: Sonny won’t fight with Carly anymore, Molly and Kristina urge their mom back into rehab, and Jason urges Sam to focus on the positive. Molly and Kristina stop by their mom’s place. They are worried about her and share their hatred of Liv. Molly finds the note that Julian left for Alexis. Kristina rants about Jerome until Molly chimes in to say what’s in the letter might be true. If it’s true, Alexis regrets not being able to say she still loved him. Kristina is sure he was too narcissistic to think otherwise. Her mom admits she was happy with him. The daughters worry that she hasn’t been going to her AA meetings. Alexis agrees to go and promises to get a new sponsor. At home, Sam watches Jason telling the baby that he will keep her safe. Curtis drops by with a gift for the baby. He fawns over her and she spits up on him. Curtis explains that Jordan may let him onto the PCPD. Jason knows that means they won’t be working together anymore. Curtis admits he’ll miss that and leaves. Jason tells Sam he’ll miss that guy. They discuss Liv’s incarceration and her father’s death. She won’t miss her father but she worries about her mom. He suggests they focus on their daughter. Later, Molly and Kristina drop by to see the baby. 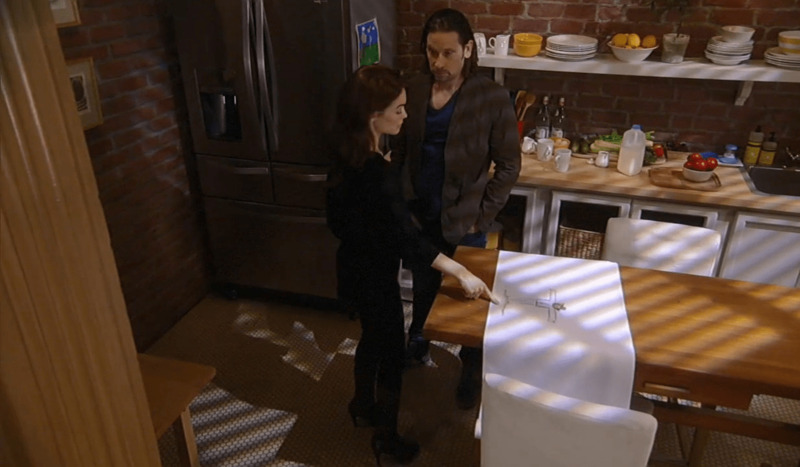 Liz and Franco are at her place, discussing his moving in. The topic turns to the therapy he’s been doing with Jake. They find a drawing of a scarecrow the kid did on his timeline with Helena. The kid jogs downstairs. When Franco mentions the drawing, Jake doesn’t know anything about it. Alone, the adults worry that he may have repressed doing it. She thinks they need to talk to Jason and realizes the drawing was in Helena’s book. Jason drops by with Jake’s baseball glove. They show him the drawing. Hayden wakes up on Finn’s couch. The doctor is taped to a chair. She gives him some water and he thanks her for helping him through withdrawal. He says the worst is over and she can let him go. She’s reluctant. Finn tries to talk her around and soon starts yelling and crying. When she makes a call, he accuses her of trying to steal his money. He grabs her hand and begs until Curtis kicks the door open. Security calls but she fobs them off. Curtis guesses they are in the middle of DIY detox and thinks she’s lost her mind. Finn passes out. Hayden says she needs to help him. Curtis warns her that addiction lasts long past detox. Carly bumps into Sonny at Perks. She tries to avoid him. He thinks there is still hope for them. Although she admits that she understands his mistakes, she needs time to move past them. When she can’t give him a timetable, he declares that he’s had enough. He thinks she should be asking him for forgiveness since she walked out on him. She rips into him for hurting her. Sonny says he’s not going to run after her if there’s nothing he can do to change her mind. Carly asks if their marriage is over. Alexis returns to an empty home, locks the door and shuts the shades before pulling out a bottle. Laura tries to get some information out of Sonny. Jason worries about the well-being of his child.